A vintage vinyl shop, a mysterious death, an even more mysterious girl, a pig snout, a dysfunctional family and a teenage girl figuring out life all make up Girl Defective. Skylark Martin leads a quiet, mundane life in a sleepy Australian town. Ever since her mother walked out on her family she’s had to take major responsibility for her younger brother Gully, and lookout for her dad who has a tendency to drink a little too much. Her only excitement comes in the form of the mysterious, older Nancy, her only friend, who’s maturity and sophistication both fascinate and confuse Sky. After a teenage girl is found dead in the city, and her father just so happens to hire her brother on at their failing record shop Sky develops both a crush on the dead girls brother and an obsession with the dead girl herself. While Sky is dealing with confused feelings about Nancy and a burgeoning crush on Luke, her little brother Gully is investigating a drive-by bricking that saw the record shops windows smashed. Gully, convinced he’s a secret agent, constantly wears a pig snout everywhere he goes. Regardless of what other people may think. Girl Defective is the story of a fractured family, fractured friendships and imperfect people. It’s also the story of a teenage girl figuring herself out. Girl Defective takes awhile to get into. Main character Skylark Martin is a multi-faceted and fascinating character, however the mundanity of her life, and all that teenage angst becomes tiresome when that’s what most of the story is. The mysteries within the novel – the truth about just who the elusive and alluring Nancy is, the identity of the “bricker” and the truth about what happened to Mia Casey slowly become less and less intriguing when they’re dragged out in such a tedious fashion. The unfortunate thing is that Girl Defective isn’t a bad book, it just lags, and because of this it’s hard to care about Sky, or any of the other characters when the story finally picks up. (Which doesn’t happen until the final 100 pages. All of the above notwithstanding, the great part about Girl Defective is that author Simmone Howell creates a variable feast of unique, multifaceted characters. Often main characters can be a bit mundane but Sky isn’t. Though quiet and shy her thoughts, wants and motives are both strange and understandable. Nancy, one of Sky’s many obsessions is enviable, you understand Sky’s fascination, yet you also don’t like Nancy because you can see selfishness that Sky won’t quite acknowledge. It’s these little intricacies in the relationships Howell develops that make Girl Defective an interesting read. The story is littered with mysteries, and their eventual reveals take awhile to get to. However within the last 100 pages the story picks up and offers satisfying answers to many of the questions that have been ongoing in the book. The book is riddled with teenage angst but author Simmone Howell handles it in a way that makes it neither grating or stereotypical. 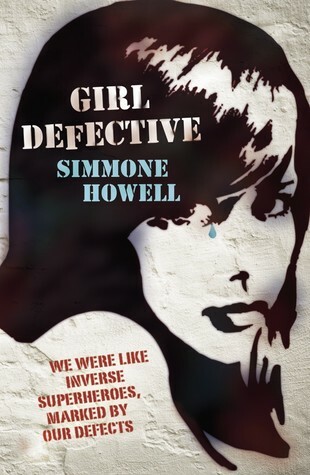 Girl Defective has some great, unique characters, all equipped with their own little quirks, from Gully’s pig snout, to Luke’s drawings and even Nancy’s overall mystery, the story may not be a fast, wild ride, but author Simmone Howell has created characters that standout and stay with you, long after you’ve closed the book.